Ideal for connecting DVD players, satellite receivers, etc. Gold-plated S-Video Connectors. Provides high-definition A/V signal transfer between DVD Players and high-End TVs or monitors for optimum picture resolution and color. Provides superior connections for digital audio equipment. Fully supports S/PDIF audio file transfer format. Suitable for general digital audio applications: CD, MiniDisc, DVD, MP3 applications. S/PDIF Digital Audio Cable. Length: 25 Feet. Provides superior connections for digital audio equipment. Fully supports S/PDIF audio file transfer format. Fully molded construction for increased reliability. SFCable has one of the biggest range of cable related products in a single store and it includes a wide selection of digital audio/video cables also. 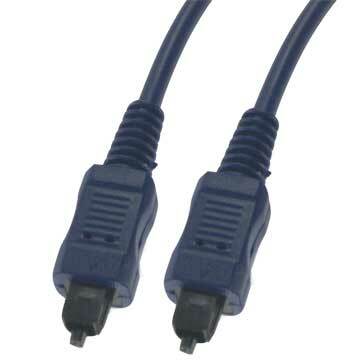 These are available with Toslink and Mini Optical connectors. Digital Audio Optical (Toslink) cables pass audio through a fiber optic cable with light. SPDIF RCA Digital Cable transmits audio through the Coaxial Digital Out on your electronics. These digital audio/video cables provide higher audio quality than traditional analog RCA cables. You can be rest assured about the quality of our cables as we work only with ISO 9001:200 certified manufacturers. Since we source products directly from them, we pass on the middlemen commissions to our customers resulting in huge discounts off market retail price.